Satellite images can provide assessment and analysis of water temperature, salinity, phytoplankton, hydrology, shoreline changes, erosion, bathymetry, soil moisture and potential threats to our coasts. Many coastal managers are changing the way they manage coastal problems. Instead of only undertaking corrective measures, officials are moving toward prevention. Using potential models with satellite imaging technology and land cover data through GIS, managers can create scenarios for future development, as well as permitting and land use scenarios, to estimate the impacts on sensitive water bodies. 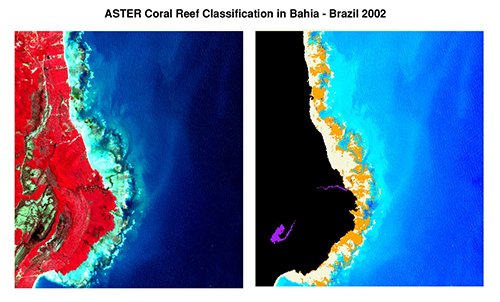 Satellite images can provide coastal management researchers and scientists with data for assessment and analysis of water temperature, salinity, phytoplankton, hydrology, shoreline changes, bathymetry, soil moisture and potential threats to our coasts. Assessments and predictive capabilities through satellite imagery incorporated with GIS are needed to predict onset of events that may significantly affect human health, critical wetlands and ecosystems, and economic development. SIC utilizes advanced color and panchromatic image processing techniques and provides services including orthorectification, feature extraction, pan sharpening with image data fusion, image enhancements, georeferencing, mosaicing and color/grayscale balancing for GIS and other mapping applications to create single, data-rich images. Our staff use programs such as ArcGIS and ArcGIS 3D Analyst to achieve a multi-layered Geographic Information Systems (GIS) product, which is widely applicable to coastal management and monitoring.